The Wickford-based home goods company is where "rustic simplicity meets contemporary style." When you go outside after a major storm and see branches strewn on the ground, it can look like a scene of destruction. But a Wickford-based couple is creating new life from pieces of fallen wood they find along Rhode Island’s shorelines and coastal woods. Using materials they’ve collected from walks with their dog and from manufacturing plants in Warwick and Quonset, Leigh Medeiros and Mark Baker have launched an environmentally friendly home goods company called Rhode Island Rustic. "We’re inspired by our surroundings, as well as materials," Leigh says. The couple decided to start the business after spending time last summer with friends in a hunting and fishing cabin in Wakefield that dated back to the 1940s. "Everything in the cabin from floor to ceiling was made of wood, from the door handles to the hooks on the walls," Leigh says. "We admired them for their simplicity and their utilitarian nature." Mark has spent fifteen years as a carpenter and made furniture for O and G Studio in Warren, and Leigh says she’s always bugging him to make things. Inspired by the hooks in the cabin, they decided to create their own and spent last winter collecting fallen branches. Rhode Island's combination of types of trees — birch, cherry, maple, oak, pine — elements and climate help shape the wood in a way that you wouldn’t find in Florida or out west, Leigh says, which is why they named the company Rhode Island Rustic. "We’re blessed because we have the salt water and the shoreline, but we also have some nearby little pockets of trees," Leigh says. "We can walk the shore, we can walk along the streets in between our home and the water and find lots of great pieces of wood." Mark experimented with different ways to cut the wood and came up with three sizes. The branches they use have to have hooks that are 45-degree angles or less, and they have to be sturdy enough to stand up to a table saw. Then the hooks are sanded and sealed by hand. "The focus is always on letting the natural wood speak for itself," Mark says. 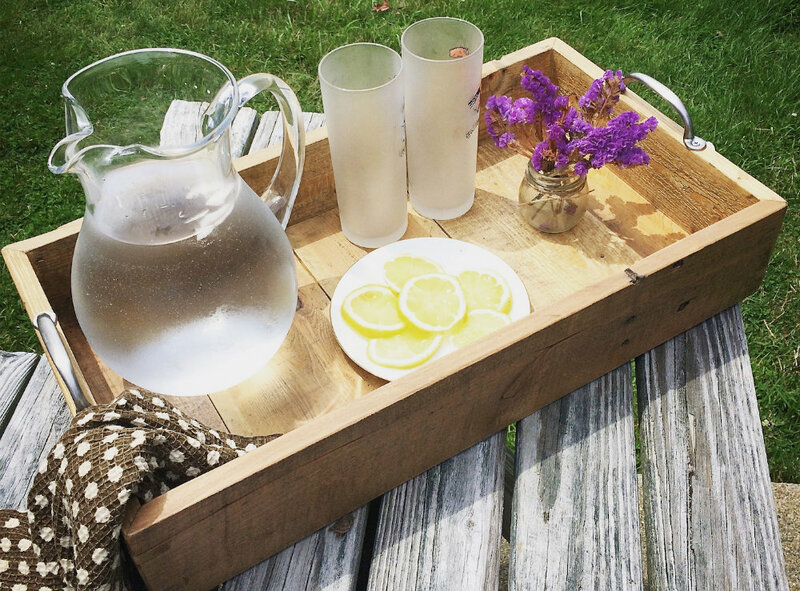 The couple has also started making blanket ladders and serving trays that are made from repurposed materials. The wood is reclaimed from pallets from local manufacturers, and the handles are made from old leather belts. They duplicate the design from piece to piece, but because the reclaimed materials are different for each, they’re one of a kind. Leigh is also making hand linens using a technique called shibori, which dates back to eighth-century Japan. She dyes the fabric using a plant-based indigo color that looks like the ocean. Now, they’re trying to make sure their inventory keeps pace with their stream of inspiration. "While we’re walking around, we’ll see things that make us think of other things to make in the future," Leigh says. "We’re constantly trying new ideas." Rhode Island Rustic's hooks are available at select stores, including the Wooden Midshipman in Warren and Island Mist on Block Island. For more information, go to their website.